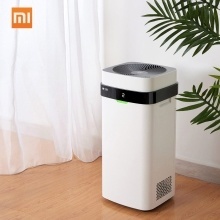 The Xiaomi Airdog Air Purifier X3(M) adopts TPA purification technology to purify the air quality level of your room efficiently, Up to 310m³/h particulate CADR for 21㎡-37㎡ application area, no need replaceable filter, just one-button control to adjust the suitable modes based on your room’s air quality level. Simple operation: One-button control, auto-adjust the different modes. Real-Time Data Display: Powerful PM2.5 sensor + LED digital + three color indicator, to update the air quality level in time. 310m³/h CADR Value: Up to 310m³/h particulate matter CADR for 21㎡-37㎡ application area. No Replacement Filter & Energy Saving: Adopts TPA purification technology, no need replaceable filter, washable and reusable. Exquisite Design: Rounded corner, beautiful appearance, no need filtration mesh.